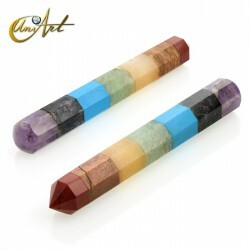 8 Facets massage wand for the Chakras balance. Medium size: 11 cm x 1,8 cm x 1,8 cm. Medium weight: 85 gr. Done with the stones for the balance of the seven Chakras, ideal for anti stress massage, relaxation, natural therapies, gemotherapy, healing in alternative therapies and manipulation of the energies. Massager in jaspe natural stone in turtle format. 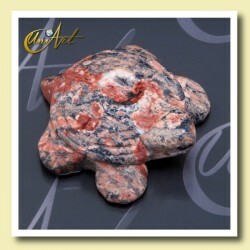 This Massager made in jaspe natural stone in turtle format is very versatile. Small and discreet to be used at any time and place. The central hole serves to massage the fingers of the hand. the legs and head for pressing reflexology points. The Massager measures: Weight: 25 gr. Size: 4,5 cm x 4 cm x 1,4 cm. 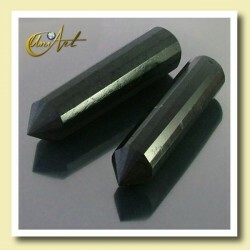 Massage wand of Black Tourmaline with 16 facets big size. Ideal for massage anti stress, relaxation, natural therapies, gemotherapy. Medium weight: 200 gr. Medium size: 15 cm x 3 cm x 3 cm. 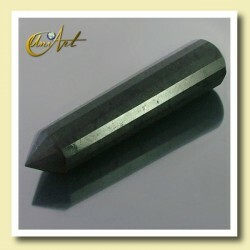 Massage wand of Black Tourmaline with 16 facets , medium. Ideal for massage anti stress, relaxation, natural therapies, gemotherapy. Medium weight: 100 gr. Medium size: 11 cm x 2,5 cm x 2,5 cm. For wholesale prices, see "Wholesale Zone".